Before you flip on the TV for the Philllies’ 131st Opening Day in franchise history, here’s a little Opening Day trivia for you. So the Phillies lost on Opening Day...again. The loss should come as no surprise considering they are now 8-16 in the last 24 Opening Days. But it was just one loss and there were plenty of positives to give us some reason for optimism. Here's a glance at the good and the bad from Opening Day. The biggest positive was glaringly obviously to anyone: Chase Bleepin' Utley. Wow, did Chase look good or what last night?! Two nights ago at about 7 pm it felt like one of those cartoons where an angel sits atop your right shoulder and the devil sits over your left. Last night they were arguing about the Phillies 0-2 start. No matter how you perceive things in Phillies World, this was a good win for the Phils. Is Phillies bullpen bigger problem than we thought? Jonathan Papelbon announced, "If we're not the top bullpen in Major League Baseball, we'll definitely be the top in the National League." Uhhh...what? The Phillies 3.94 bullpen ERA last season ranked 10th in the NL and without Papelbon that ERA balloons to 4.24. But what else would you expect from a guy with an alter ego named Cinco Ocho? Pappy might have gone a little too far here, but it seemed reasonable entering this season to expect a solid Phillies bullpen. Amaro added possibly the best setup man in the league in Mike Adams in front of one of the best closers in Papelbon, to go along with a veteran like Durbin and a bunch of quality young arms. In theory the Phillies' relievers could be a strength of the ball club. Nothing like a combined 15.42 ERA from Durbin, Horst, and Valdes to alter your expectations. But what has really changed with the bullpen? One obvious change is the eighth inning. 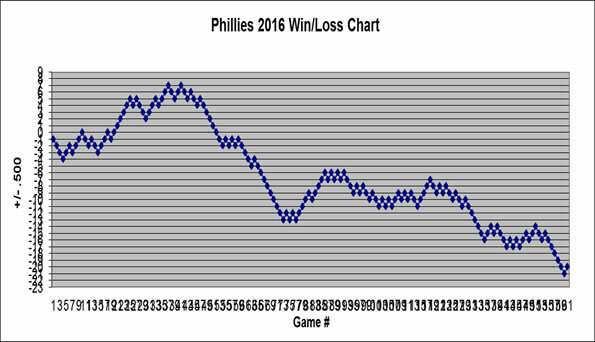 The Phillies 4.89 ERA in the eighth inning last year ranked second worst in all of baseball and they blew 13 eighth inning leads. Ruben replaced that with Adams' career 2.28 ERA, 1.056 WHIP, 6.9 H/9, 2.6 BB/9, and 9.0 SO/9. In his last four seasons before last, the 34-year-old posted ERA's of 2.48, 0.73, 1.76, and 1.47 with an average of 59 appearances per season which came almost exclusively in the eighth inning. But what about the innings leading up to the eighth? I hate cliff hanger endings. In the era of season finales and mid season finales, TV dramas drop cliff hangers on us like crazy. Who knew Roy Halladay was also in on it? On March 17, I planted myself on the couch to enjoy a Sunday afternoon Spring Training ballgame. It was my first chance to watch Roy Halladay pitch since his injury riddled 2012 campaign. Instead of preparing a shiny new scouting report for you of the new Roy Halladay, I was exploited by a cliff hanger. Halladay, unbeknownst to us, was fighting a stomach virus and lasted one inning. It would be 17 days before we got to watch Doc again. April 3rd would be everyone’s chance to figure out, once and for all, what to expect from Roy Halladay. Yet for me, I felt no less confused at the end of Halladay’s performance than I had after observing his “stomach virus” game. In what proved to be a truly peculiar evening, Halladay allowed three runs and threw 40 pitches in the first inning in the same game in which he became the first pitcher since 1916 to strike out nine batters in less than 3 2/3 innings. As head scratching as the outing proved to be, there were a few takeaways from Halladay’s performance. To discover the answer to the whole Roy Halladay fiasco, we are going to play our own version of Mad Libs with the below paragraph. Roy Halladay has been [ADJ. FOR FOUL ODOR] this season. His control has been [ADJ. LIKE BAD], he has little cut on his cutter, and his fastball must look like a(n) [ADJ. FOR SOMETHING BIG] because it has been [ADJ. LIKE SMASHED]. Halladay has done all of this with a reasonable velocity of 88 to [NUMBER]. Fun, right? OK, maybe I need to get a life. All games aside, it is that last number which makes Roy Halladay such a curious case this season. When news broke in Spring Training that Roy Halladay's velocity was as low as 84, smoke alarms went off all over the Delaware Valley. The walks and lack of movement weren't huge concerns. Those were both sure to come around - I mean, this is Roy Halladay we are talking about here. It was the V-word that frightened little children. Which is what makes his first two outings so perplexing: his velocity has been fine. Halladay has only lost a couple ticks off his fastball, still throwing consistently in the low 90’s and marginally harder than both Vance Worley and Kyle Kendrick. Remember last offseason when the Marlins were picked by many to win the NL East? Those time certainly have changed. The Marlins dumped salary and players in a way even they had not done before. It is borderline criminal what the Marlins have done to their roster and their fans. Here's a quick look at how much they have changed in just one year. Phillippe Aumont entered a tie game in the ninth, walked the leadoff guy, recorded only one out, and proceeded to lose the game for the Phils to an awful baseball team. Yep, and I could not be prouder of him. Phillippe Aumont surely has the stuff to be the future closer of the Phillies organization, but he has not shown the head of a future closer early on in his career. The whole Roy Halladay story has brought with it constant references to Harvey Dorfman, Doc's mentor and the author of Halladay's Bible, The Mental ABC's of Pitching. That book chronicles the mind of a major league pitcher and provides the context of which to judge all pitchers. The Mental ABC's helps us understand the importance of a pitcher's presence on the mound - strong minded pitchers are careful not to show emotion and to never give the slightest indication of weakness. We witnessed with Cole Hamels in 2009 just how important a pitcher's presence is to his success. Hamels constantly voiced his displeasure with umpires and showed his frustration when fielders made a mistake. The result was the worst season in Hamels' career. I bring this all up because Aumont has displayed much of the body language of an immature and un-veteran-like pitcher on the mound. Roy Halladay pitched eight innings and allowed just one run on Sunday for his first win of the season. Problem is, that win came against a Marlins team that has scored nine earned runs in 75 innings against starting pitchers this season for an ERA of 1.08--technically Halladay’s 1.13 ERA in the game was worse than the average starter. Facing a historically putrid offense rendered it impossible to permanently change any opinions. Regardless of the outcome, everyone will wait until he faces a real offense like the Cardinals on Friday. So what can we take from his outing? What do the stats tell us about Ben Revere? Figures don't lie, but liars figure. I guess that makes me a liar, because I figured the hell out of Ben Revere. When the Phillies traded for Ben Revere in January, you had to figure he would be a centerpiece for the organization for years to come. The potential was sky high. He hit .294 in 2012, stole 74 bases over the last two seasons, was tied for 3rd last season with 9 bunt hits, and played a mean centerfield. Suffice it to say that the start to Revere's Phillies career won't have anyone printing any Wall of Fame plaques. Revere is hitting .211 with one extra-base-hit and 7 runs scored in 18 games. Odds are he is just in a slump and maybe batting leadoff for a new team in a new league was too much for him. That might be the case, but what he is hitting is not as worrisome as how he is hitting. Everyone and their grandmother knows that Ben Revere has not hit a big league homer, so it is safe to say Mike Schmidt's home run record is safe. A better comparison is with Juan Pierre, who doesn't work many walks but makes up for it by slapping hits through open spaces. So far, though, Pierre is looking like Babe Ruth compared to Revere. Not only is Revere not getting extra-base hits, but he is barely getting the ball out of the infield. Out of his 56 balls in play, only 12 of them, 21.4%, have left the infield. That is not too much of a surprise considering his career rate is 31.7%, but this is where the stats can lead you down a bad path if you aren't careful. I took Ben's 68.3% ground ball rate as the sign of a player who understands where his bread is buttered and knows he must utilize his speed. Surely, this would be the season where he started to refine his approach and drive the ball. Right? $3.58 million per win. That is how much Cliff Lee earned last season for the Phillies. After going 17-8 the year before with a career winning percentage of .617 and an average of 15 wins per season, Lee finished with just 6 wins in 2012. So was it just a case of bad luck or was it possibly the signs of a declining pitcher? Cliff Lee probably calmed all fears with a 1.52 ERA and an average of 7.9 innings in his first three outings, but should we be concerned with 5 earned runs in 5 innings on Saturday and a blown lead yesterday in a tight game? Save your concerns for the Phillies 9-14 record, their 10th ranked NL offense, their league leading 23 double-plays, or go right on down the list of players not hitting (Revere, Brown, Kratz, Howard....), because there is no need to worry about Cliff Lee. It was just one of those years and one of the strangest starts to a season for a starting pitcher. Cliff Lee was winless in his first 13 games before a July 5 victory due to a combination of a fairly high 4.13 ERA and poor run support of 2.6 runs/9 while he was the pitcher of record. Even so, the difference wasn't large enough to explain a goose egg in the win column. Consider it a case of the wrong place at the wrong time 13 straight times. Like a father watching his son ride a bike on his own for the first time, I am super proud of Kyle Kendrick and you should be, too. Or, as Jim Salisbury put it, "Kyle Kendrick has become a man." The ups and downs in Kendrick's career are like a bike ride through the Appalachian Trail: minor leaguer-turned major leaguer-turned playoff starter in 2007; major leaguer in 2008-turned minor leaguer in 2009-turned major leaguer in 2010; reliever-turned starter-turned reliever-turned starter in 2011 and 2012; and a fake trade for Kobayashi thrown in for good measure. Adding Ruiz without Aderall: what will Phillies get? Carlos Ruiz returns to the Phillies today and he will do so without his long lost friend Aderall. Although it might be a fun drug at parties or to cram for a big exam for college students, Aderall doesn't exactly scream baseball. Aderall doesn't improve bat speed, it doesn't add distance on home runs, and it doesn't help players rebound quicker from injuries. But what it does provide might be the biggest benefit of all for a catcher: it improves concentration. Think about the life of a catcher for a moment. Feeling down about the Phillies on a miserable Monday? If you are a glass half-empty kind of guy, you might take pleasure in knowing that some former Phils are having really bad seasons. Just to give you a basis for the truly alarming numbers you are about to see, keep in mind that the league average for WHIP is 1.31 and Chad Qualls had a 1.53 WHIP last season for the Phils.